This really is a full-on professional DAW for iPad, albeit one that currently only records, processes and mixes audio, not MIDI. Multi-input recording. Up to 48 tracks of playback. VST plug-ins! We couldn't make it crash. Included channel strips are excellent. No MIDI... yet! Some effects can be CPU-intensive. There are some great iPad DAWs out there, but most of them suffer from limited track counts, mediocre effects, anemic editing options and/or general lack of parity with their desktop counterparts. Auria sets out to create a new standard of quality with 24-bit/96kHz recording, up to 24 inputs and 48 tracks, along with VST plug-ins - yes, you read that right! - built by genuine heavyweight developers. "Seasoned desktop producers will feel instantly at home with Auria"
Auria takes advantage of iOS' USB 2.0 compatibility to record multiple simultaneous inputs. The Auria site provides a growing list of interfaces known to work - both our Alesis iO Dock and Lexicon Omega worked beautifully. Seasoned desktop producers will feel instantly at home with Auria. There's a mixer with up to 48 channels, plus eight sub groups and a master channel, the latter giving access to a pair of auxiliary effect returns. Tapping any channel's FX button brings up a complete channel strip plug-in (courtesy of PSP Audioware, no less! ), four insert slots, phase and saturation buttons, and a track freeze button. The channel strip comprises an expander, EQ and compressor, and the bus and master channels get a 'MasterStrip' variant. 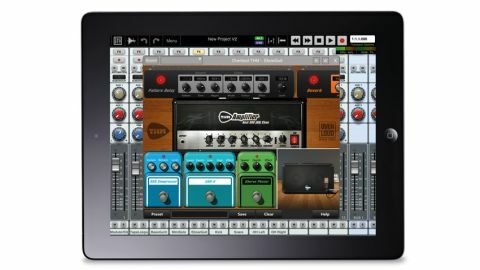 The channel strips are included with Auria as standard, as are a few other effects, while more are available as in-app purchases. Auria's track view displays tracks and audio clips in the traditional linear fashion. In the left-hand column you can select tracks, access automation, activate mute/solo, etc. Automation is handled in the usual graphical fashion (recorded and/or drawn) and can be applied to plug-in parameters as well as mixer controls. The ruler can be set up to display bars/beats, minutes/seconds, SMPTE, etc, although it doesn't always perfectly align to playback - an inherent problem with the iPad's GUI update rate, apparently. Edits can still be made accurately using the ruler, so it isn't a huge issue. Auria has the feel of a professional recording system. It's got delay compensation, a flexible input matrix, pre- and post-fader metering (peak and RMS), 64-bit mixing, optional video support, adjustable SMPTE frame rate, convolution reverb and a range of export options, including AAF, SoundCloud and Dropbox. "What it doesn't have is significant: MIDI. But we have it on good authority that it's on the way"
What it doesn't have, though, is significant: MIDI. You can, however, link it to other devices via WIST or Auria's own AuriaLink, and we have it on good authority that MIDI is on the way (possibly as an in-app purchase). Auria lives up to the hype. It isn't perfect, and iOS limits what can be done (for now). For example, the iPad's handling of memory can slow things down after long sessions, but only temporarily. Still, we managed to play back 48 tracks on our iPad 2, although there was audio artifacting at the start of the tracks with the Alesis unit. Anything under 32 tracks, however, was pristine - the sound quality is there, and you get out as good as you put in. Often better, in fact, thanks to the excellent effects. Auria is the real deal. If you want to record and mix audio on your iPad, it's well worth the price. We had no trouble at all recording a full, professional quality production from start to finish with it. Oh, and not a single crash.